Hillary Clinton press conference: Non-answers to bad questions. Hillary Clinton takes questions from reporters in Cedar Falls, Iowa, on Tuesday. 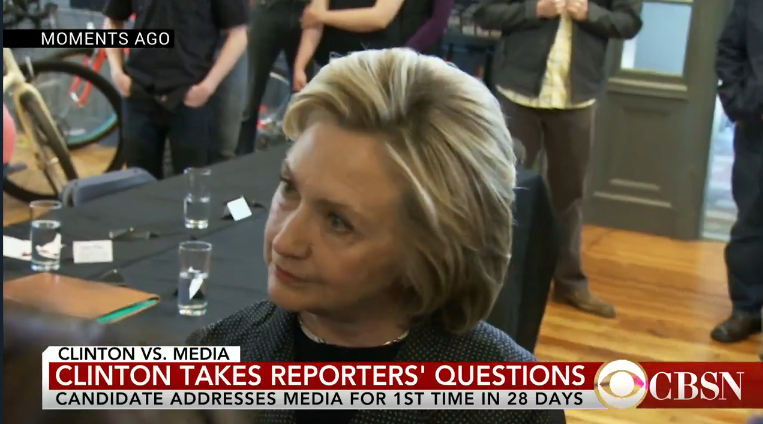 For the first time in 28 days, Hillary Clinton on Tuesday took questions from reporters. During a brief unscheduled Q&A in Cedar Falls, Iowa, members of the press asked Clinton about the enormous income she and her husband earned from speaking gigs, the eventual release of her State Department email archive, and her receipt of advice from Sidney Blumenthal, a longtime ally who had reportedly been blocked from holding an official State Department job by the Obama White House. Unfortunately, the questions that were put to the Democratic front-runner were vague enough that she was able to run out the clock without actually answering them. Blumenthal, for example, is reported to have given Clinton Libya-related advice at the same time he was working as an adviser to a group that was hoping to do business in Libya after the fall of Muammar Qaddafi. Did Clinton know about Blumenthal’s apparent conflict of interest when she was weighing the U.S. government’s options in that country? It’s still not clear, because the reporter who asked about Blumenthal merely inquired whether Clinton would maintain relationships with “old friends” if she became president. Welp. What follows are suggestions for specific questions about Clinton’s Libya deliberations and her private email use that would be more likely to provoke a newsworthy answer. 1. When Sidney Blumenthal was sending you advice and information about Libya, were you aware that he was also working for a group with a financial interest in certain political outcomes in Libya? 2. Did you ever consider hiring Sidney Blumenthal as an empoyee in your State Department? And, if so, did the Obama administration block such a move, as has been reported? Did the White House know that he provided you with unofficial advice nonetheless? 3. Several lawyers have suggested that, by law, Blumenthal should have registered as a foreign agent given that he provided you with information on behalf of a politician in the former Soviet republic of Georgia. Do you agree that he should have? If not, why? 4. In 2007 you described the use of private email accounts by several Bush administration officials as an insult to the Constitution. How was your use of a private email account as secretary of state any different? 5. In 2009, while you were secretary of state, a regulation was released stating that official email sent or received on a private email server should be turned over to the government for recordkeeping. Why did it take you five years—until December 2014—to follow this guideline by turning over your emails to State? 6. You said in March you used private email for convenience at State so you wouldn’t have to carry around a smartphone for official email in addition to your regular phone. But in other interviews, you’ve told audiences you use an iPhone and a BlackBerry and also have an iPad and an iPad mini. Don’t those statements about your device preferences contradict each other? 7. Did Tom Brady know about the deflated footballs, or what? Let’s hope Clinton takes questions again sometime soon, and that the reporters covering her don’t go straight to No. 7.